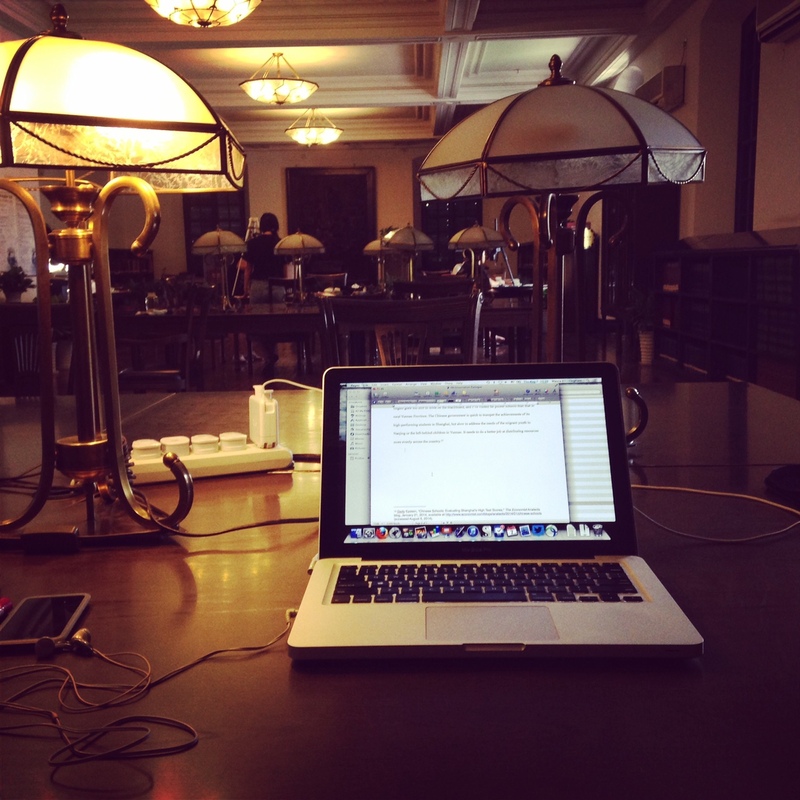 In the reading room at Shanghai’s Bibliotheca Zikawei, on the afternoon I finished and submitted my dissertation. I have a very clear memory of finding out that I’d been awarded a UC Pacific Rim Research Grant, because I thought I’d been rejected. I had already received two letters like that (though I’d also been awarded two small grants by professional organizations), and I’d decided that if the PacRim didn’t go my way, I was done with graduate school. In some ways, I would have to be done: I couldn’t self-fund a yearlong research trip to China, and I couldn’t write my dissertation and finish the PhD without that trip. But I was also feeling done in a broader sense: if none of the major grant organizations I had applied to thought my research was worth funding, I would take that as a sign that academia was not the place for me. I already had a pretty strong hunch that might be the case. So I walked into my apartment and took my time getting settled—changing out of my work clothes, unpacking my briefcase, fixing a snack. I finally opened my email and clicked on that attachment, seeing with great surprise that the first sentence read, “I write with happy news.” I had money to fund my research year. Future UC students won’t get that happy news, because the Pacific Rim grant has just been ended. (Apparently that information was posted on January 1, but the announcement just made its way into my social media networks.) The program had been gutted a couple of years ago, when the full-scale grants like the one I received were suspended and only mini-grants were available (something I wrote about for the LA Review of Books at the time). But now the UC Office of the President has declined to renew the PacRim funding, and the program is over. I find this incredibly frustrating—and I’m standing at a distance. I can’t imagine how it feels for the second- and third-year grad students who are looking ahead at the next couple of years and seeing that another major funding source has dried up. Well, there’s still the Fulbright-Hays … if you’re a U.S. citizen, and if the program isn’t suddenly suspended (that’s already almost happened once, which I wrote about for China Beat back in 2011). Many other grants, such as those offered by the Luce/ACLS China Studies Program, are for pre-dissertation summer fieldwork, or they’re like the ones I received from the Association for Asian Studies and the Children’s Literature Association—small grants of $1500 or $2000. Those grants are useful and important, but not enough for a long research trip. I regularly talk to prospective grad students who are interested in studying at UC Irvine and want answers to their questions. I’m still enthusiastic about UCI and its Chinese history program, but I’m also honest with those applicants: the biggest funding challenge they’ll face isn’t as PhD students in California, since UCI History now guarantees a certain level of funding for everyone entering the program. Instead, they’ll face a problem when it comes time to do research overseas, because there just aren’t that many places offering money right now. Too many people are applying for too few dollars. Receiving the PacRim kept me in graduate school for an additional two years—the years I needed to research and write my dissertation. Getting that grant was also, to be honest, an incredible boost of confidence at a time when I felt very little in my academic skills. It signaled to me that someone beyond my advisors and professors at UCI thought I had good ideas that were worth pursuing. I took the research conducted with PacRim support and turned it first into a dissertation and then into a book proposal that’s now under contract with Oxford University Press. So even though I didn’t wind up with a traditional tenure-track academic job, I’d like to think that the PacRim administrators would look at me today and see money spent wisely. Even if someone thinks the funds weren’t put to good use in my particular case, there are more than 800 other projects that the PacRim has supported since it began in 1986. Those projects cover academic fields ranging from history to public health and investigate countries all around the Pacific Rim. The PacRim program was broad, both geographically and disciplinarily, and resulted in enhanced understanding of an enormous region. Why, I have to ask, is that not worth continuing?